The Digital Voltmeter option activates an integrated 4-digit digital voltmeter and 5-digit frequency counter that operates through the same probes already attached to the oscilloscope channels. View realtime measurements through a dedicated user interface display that continues even when your triggering system is stopped. 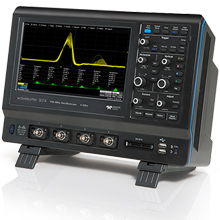 Thank you for purchasing a WaveSurfer 3000 Oscilloscope.